Hello there, today starts the teasers for the August release from Clearly Besotted. From now until (and including) the 5th August, myself and the rest of the DT will be sharing samples showcasing the new products. Returning to Guest Design this month is the fabulous Cindy Lovell and joining us for the first time, is the amazing Keren Baker. I have to say, I think this may be my favourite ever release to date. If you love colouring, you are going to adore this release! I am starting of my teasers by using the new You Rock stamp set. It is a set filled with super cute dinosaurs, as well as lots of images that can be used to make up scenes. I started off with a panel of white cardstock and went to town stamping all the different images. I masked off as I went, to create some depth of field. I then simply coloured the image in, using Copic Markers. The sentiment, from the same set, was stamped in the bottom right, using black ink. I then adhered the panel to a white A2 card base with foam sheet. COPIC MARKERS: Green dino: YG17, YG25, YG23, YG21, YG05, YG01. Red dino: R89, R59, R37, R24, R14. Y17, Y15, Y11. Purple dino: V09, V06, V05, V01, V000. Mountains: E42, E40, W5, W3, W1. Ground: E47, E44, E43, E42, E41, E40. Rocks: W7, W6, W5, W3 | W5, W3, E40. Trees: YG17, YG23, E37, E35, E31. Sky: B01, B00, B000, B0000. This did take a while to colour but I have to say, I am delighted with the results :) Aren't those dinosaurs just adorable?! :) Thank you so much for visiting me today. 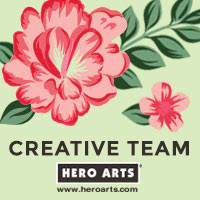 Please pop over and see Stephanie, who will not only have some amazing cards to share with you, she will also have links to the rest of the Design Team and Guest DT sharing today. I hope you will pop back and see me tomorrow for my next two teasers. 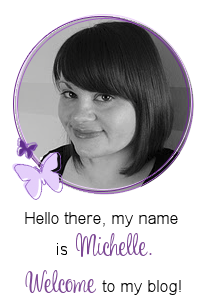 It is absolutely amazing, Michelle! You've created a spectacular scene, beautiful coloured! Oh my- a perfect scene- they look fab ! Gorgeous colouring! it is a very funny card, nice colorwork. Oh my,Michelle!!! You ROCKED this Set!!! I just adore the scene you've created and your coloring is amazing!!! Super cute!! I just love those dinosaurs!!! 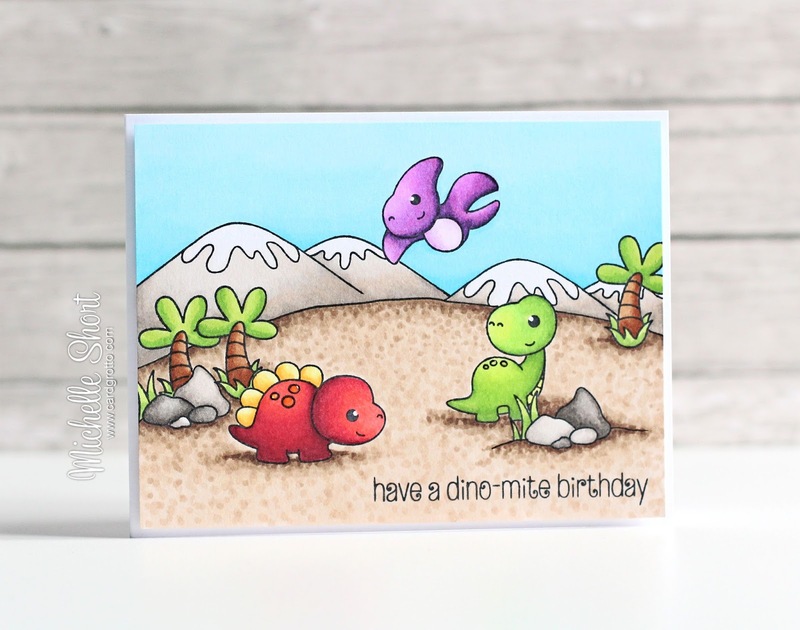 My word this is so so cute, clever how you have made a scene to match the cute stamped images. Love the colours too!! Great card Michelle, so cute and how I wish I had your colouring skills !! 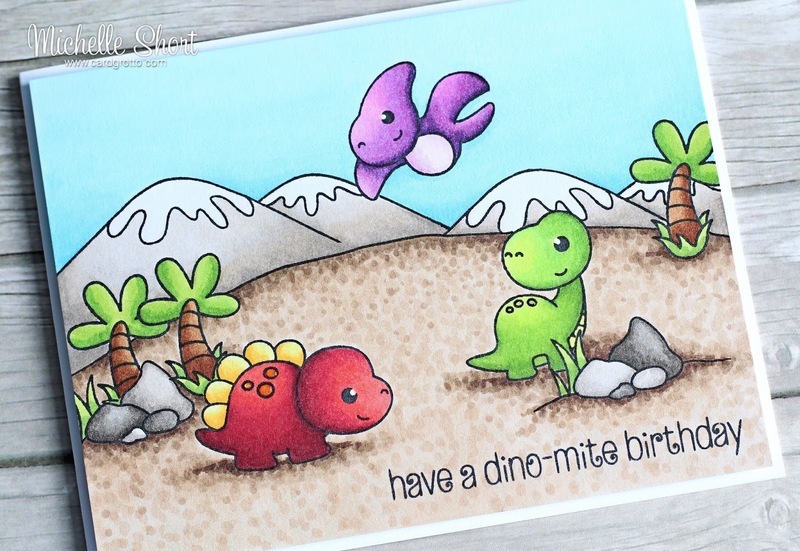 Super cute and a fabulous little dino scene.